Gesture effects are what you need when creating tutorials based on mobile and touch devices. They are visual effects that simulate taps, swipes, pinches, and the like in your demonstration. Gesture effects are animations for touches, swipes, and pinches. They look like animated GIF images which show how the users interacts with the software on the touch screen. To insert this type of object, click the Annotations tab > Gesture Effects. Position the effect: On the Canvas, click and drag the effect to where the touch event should take place. Perfect the timing: In the Timeline pane, click and drag the time bar along the timeline so that the effect happens at the correct time. Change the color: In the Properties pane > Size & Properties > Gesture Effects, click the color picker to select a new color. In addition, you can adjust the transparency of the effect. 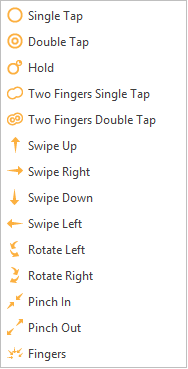 Replace the effect: Select a new gesture effect from the Type drop-down list to replace an existing one. Use touchscreen gestures to let users know exactly where and when touch events take place in your demonstration. Hope that this helps.